I’m not dead yet! Just slightly woozy from the antibiotics I need to take for the next month… I’ve been doing stuff, but I just don’t have anything to show for it. Nor anything super exciting to tell – maybe in a couple of days, though. You see, I’m waiting for ELVIS! I did the shoulder strap for my sweater bag, but I didn’t sew it up yet. It’s in the tumbler as of right now. And a slight colour difference, so I think I may throw a bit of dye after the bag itself. Contemplating getting some felting needles…. I have some cloths sitting around wrapped up with leaves. I dyed some yarn, testing to see if I could get a faded denim look to it, I could, but the skeins are all jumbled up and in the very long process of being wound into balls by hand. But that’s something to play with in the future. And a nice scarf perhaps to match jeans? 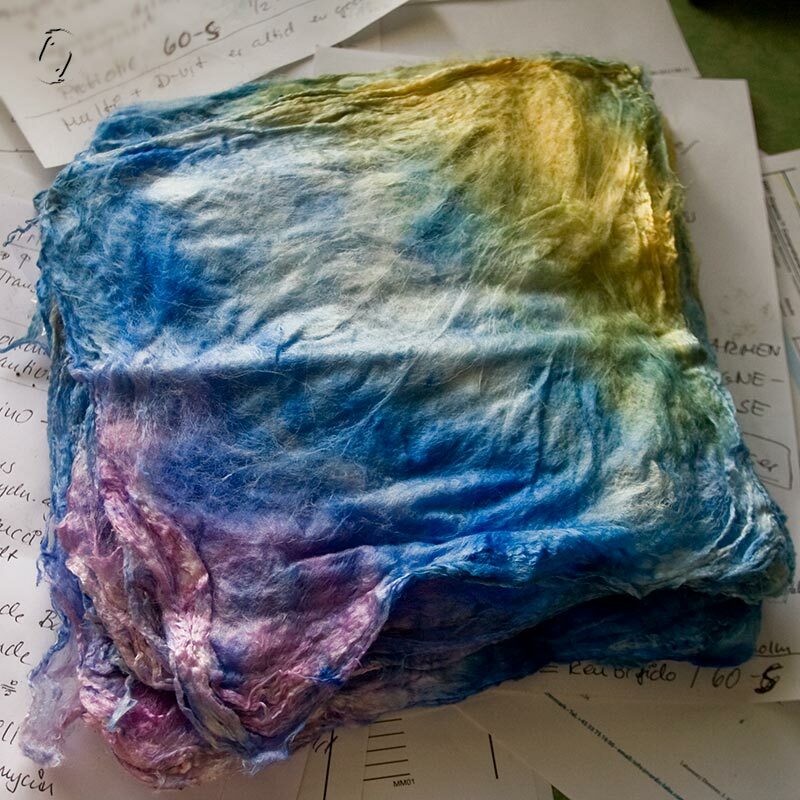 I also dyed some silk hankies to use for my cold fingers. Going to knit them as is, not spin them, just pull them out. They’re a bit unclear in the colours due to my experiments into setting the dye. I can’t ever just do something by the book it seems, always have to add a bit of “what if”. I did have some alpaca I wanted to use for mittens, but it happened to be perfect with another yarn for another project, so we’ll see if there’s enough for mitts when I’m done. Right now I’m having a bit of trouble understanding the instructions for the yoke… Or rather, how to keep track of it all without losing my place. I need something warm and cosy for winter days knitting, spinning and writing, so the summer cardigans are on hold. 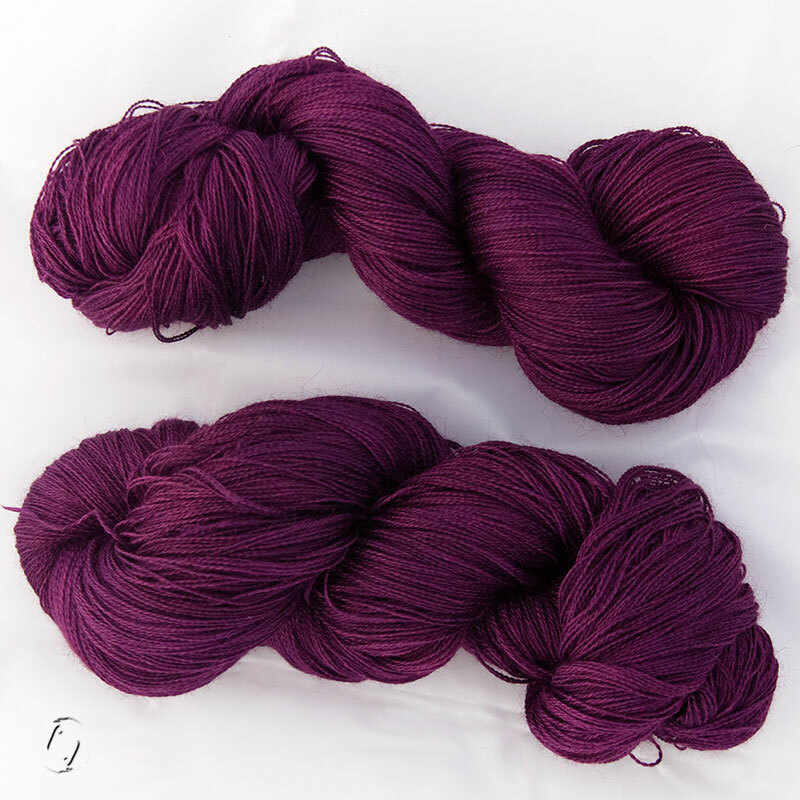 I got my lace yarn for the Sunberry dress all nicely dyed up quite a while ago, decided to do the entire 200 g although I won’t be using that much. It would be such a shame to be 10-20 g short! I’m thinking a matching shawl or shrug could work out, I always get cold very easily. Or if not, my mum has claimed it’s her favourite colour. And after writing this earlier, I’m now thinking of overdyeing the yarn anyway with the denim effect to get a slight, ever so tiny blueblack effect to the purple. Any opinions on that? I HALF finished the collar on my ugly sweater, hoping that SW merino is softer than whatever the rest is. My first magic loop project btw. And finally there’s my sweater project, I’ve spun the redbrown fiber, moving on to the grey and black asap. And I got more from World of Wool, so off we go, dyeing and spinning. 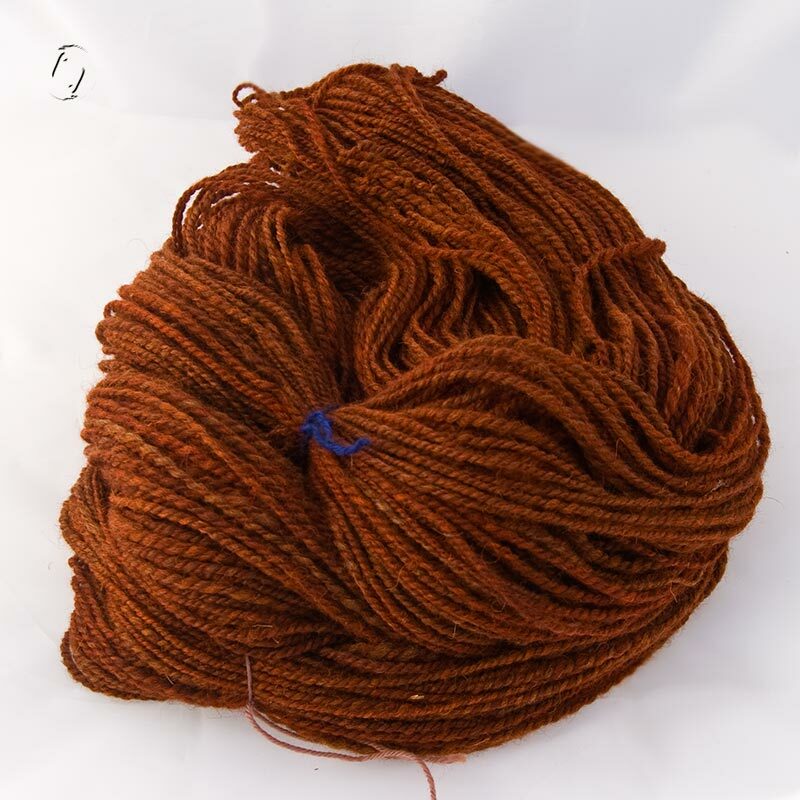 It’s very squishy, more so than I thought it would be, compared to the Gotland I spun last year. I hope I can make all the yarn match this one in style and feel. Jeg laver en hel masse – men har bare ikke noget at vise frem. Skal i gang med næste farve shetland til Spindeforeningens sweater SAL, næsten færdig med at filte min sweatertaske som lige skal sys sammen og måske farves lidt og dekoreres? Har farvet silke som skal strikkes til fingerløse vanter uden spinding, bare trukket ud til en snor. Har leget lidt med farvning af garn og overvejer at give det lilla en lille tur mere. Satser på nogen lidt mere inpirerende updates når jeg ikke længere er bimmelim af den antibiotikakur jeg skal tage den næste måneds tid…. Det blev også et temmelig kort resume, den engelske udgave startede jeg egentlig for længe siden, men lige nu må I andre have detaljerne til gode. I am so sorry that you are going to have to go to Ikea. Such a shame. LOL. Holy monkey, you’ve got a lot going on! Can’t wait to see how the silk hankies knit up. Am very curious about that. Love your “what if” spirit. Excited that you’re going to make a place for painting… feels good to have that creative space, even if it’s a tiny corner it becomes sacred. Sorry to hear you’re not feeling well. No fun. 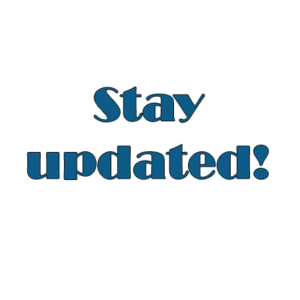 Feel better soon and post lots of FOs! Pulling silk hankies is really tough on the fingers I tell you! And difficult to draft even. But the bits that are not too stretched are very fluffy and will make great insulation I think with air trapped in the fibers which silk normally doesn’t have when spun. Only 1/4 into the process before I can begin knitting. Think I’ll wear thin riding gloves for the rest and hop i can still feel what I’m doing. Ja, jeg holder også til ovre på Blogger og også med en tosproget blog 😉 Vi har “snakket sammen på Ravelry, og jeg anede ikke at du havde en blog. Den glæder jeg mig til at læse i de kommende mørkke vinteraftener, hvor man ikke kan male på grund af de ¤#%%((@ sparepærer.